Well that was quick. Less than 2 months ago Fed chairman Powell said that interest rates were “far below neutral” (implying that rates needed to be hiked much more). After the stock market has fallen 10%, Powell now thinks that “interest rates are close to being neutral” (implying that fewer rate hikes are needed). The stock market rallied on this news. 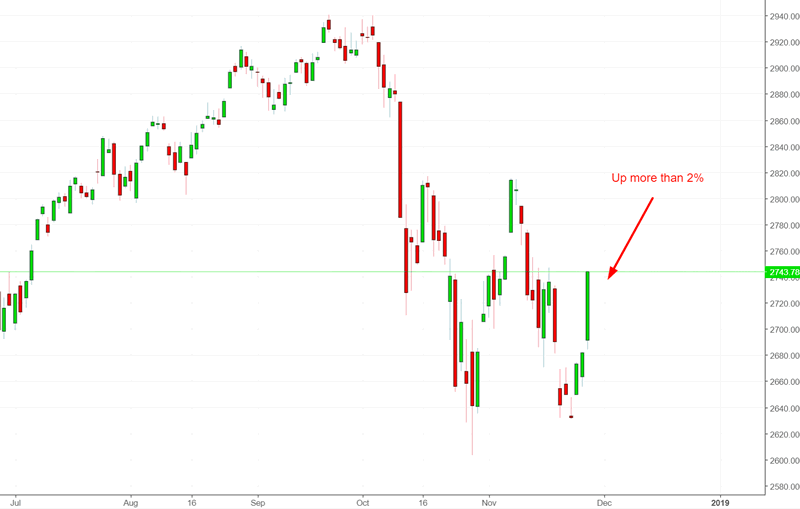 Will the Fed stop hiking interest rates in 2019? If the Fed stops hiking rates in 2019, then that will be the setup for a medium term (multi-month) relief rally. The stock market did ok over the next 4 months after the last rate hike in each economic expansion, after which trouble brewed. Investors should watch out for the first rate cut after the last rate hike in each economic expansion. 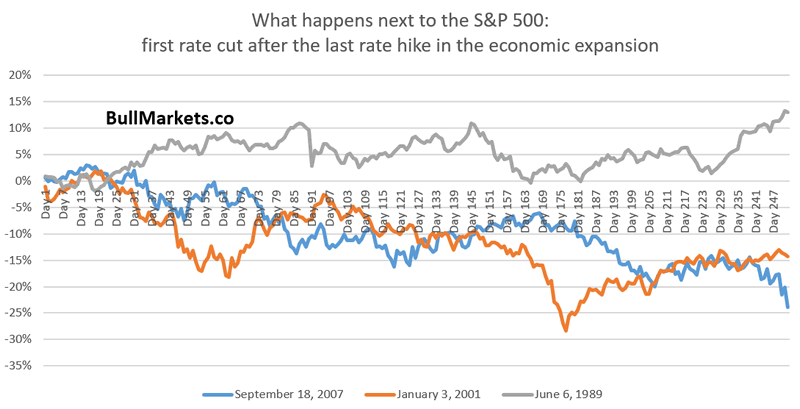 So why is it that the stock market tends to perform poorly (a recession is on its way) AFTER the Fed cuts rates? Because the Fed is reactive. It reacts to economic data. The Fed cuts rates because the economy is deteriorating. Significant economic deterioration = long term bearish for the stock market. This will be a long term bearish sign if the Fed starts to cut rates in the second half of 2019. Housing Sector: significant economic deterioration in 2019? While everyone was focusing on Powell’s speech today, the real news came from New Home Sales. New Home Sales continues to fall. 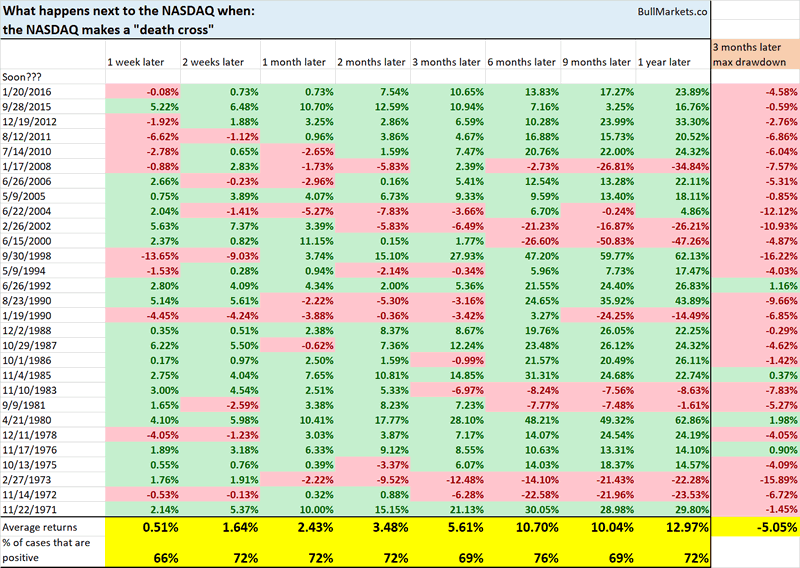 The macro economy is deteriorating, which supports the case for a bull market top in 2019. Remember: tops are a process, not an event. That’s why tops tend to be flat with lots of volatility. Here’s what happens next to the S&P 500 when New Home Sales is below its 12 month moving average for 5 consecutive months. As you can see, this isn’t definitevely long term bearish for the stock market. But if New Home Sales continues to deteriorate, then that will be a long term bearish sign for stocks in 2019. The latest FINRA margin debt figures came out today. Margin debt fell in October, along with the U.S. stock market (the 2 tend to move in the same direction). Mark Hulbert wrote an interesting piece on Market Watch. Apparently some bearish advisors are basing their bearish outlook on the recent plunge in margin debt. “Margin debt falling below its 12 month moving average is bearish for stocks”. Here’s what happens next to the S&P 500 when margin debt falls below its 12 month moving average. As you can see, falling margin debt isn’t necessarily bad for the stock market. Margin debt tends to move in the same direction as the stock market (i.e. coincident indicator). 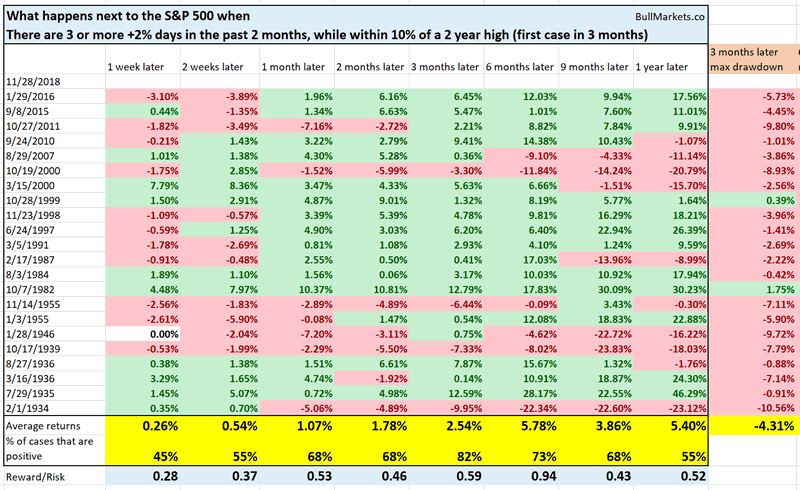 There have been 3 +2% days in the past 2 months. That is uncommon, especially with the S&P 500 less than -10% from a 2 year high. (Most big “up days” occur after the stock market has fallen a lot and daily volatility is extremely high). 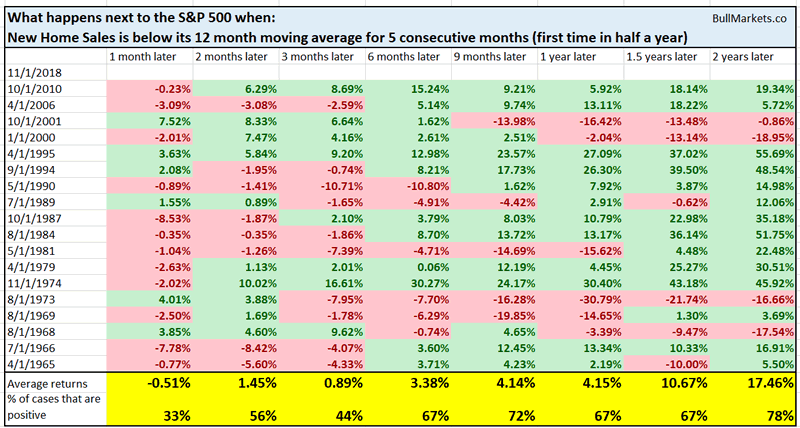 As you can see, the stock market tends to go up 3 months later, after which forward returns deteriorate. 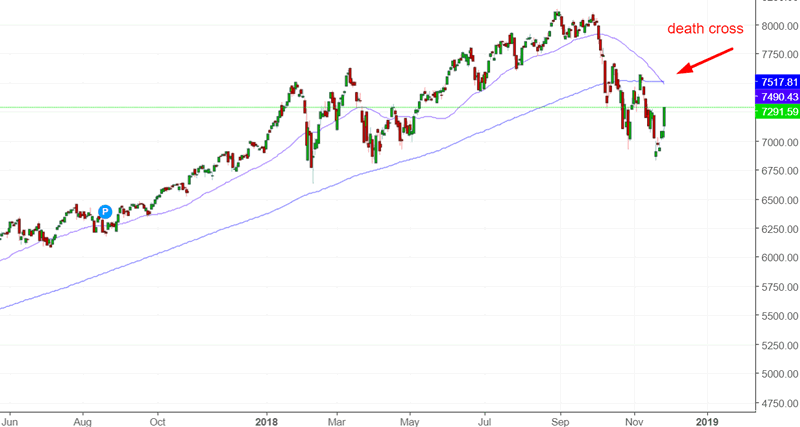 And lastly, the NASDAQ made a “death cross” today, whereby its 50 day moving average fell below its 200 day moving average. I wrote about this several days ago. As you can see, death crosses on their own are not bearish for the stock market.